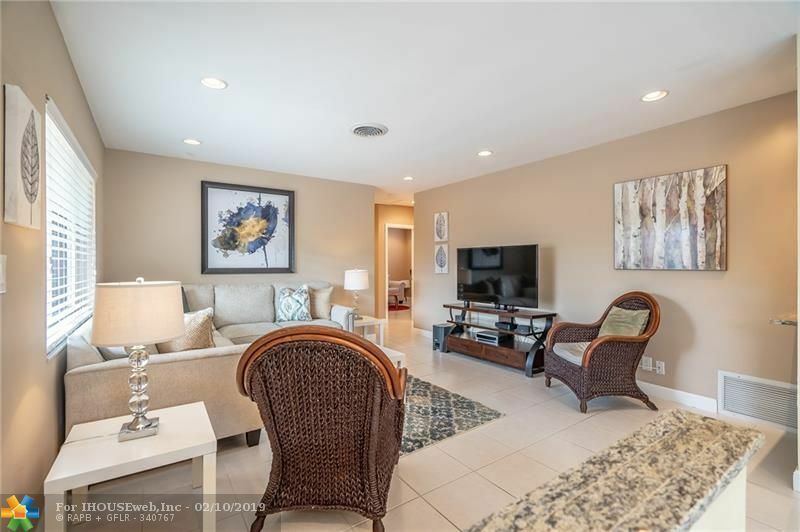 Come see this gorgeous waterfront oasis in the heart of Wilton Manors. Just 2.5 short blocks to Wilton Drive. Tile floors greet you as you enter this warm & inviting apartment. The galley kitchen features S.S. appliances & white shaker cabinets w/ granite tile countertops. Both bathrooms feature vessel sinks & glass shower enclosures. The interior laundry also features ample storage plus front loading washer & dryer. Enjoy tranquil water view from your private covered patio or enjoy sitting on the dock & watch the kayakers float by. This apartment also has impact windows & doors for added energy efficiency, security & storm readiness. Pets on case-by-case basis & w/ $250 non-refundable pet fee. Good Credit & references a must! Can be rented furnished if needed! Directions: Wilton Drive To NE 21st Court, South To NE 20th Drive. Turn Left And Property Will Be On Your Right. You Can Also Take NE 7th Avenue, South From Wilton Drive, Turn Right Onto NE 20th Drive And Property Will Be On Your Left.